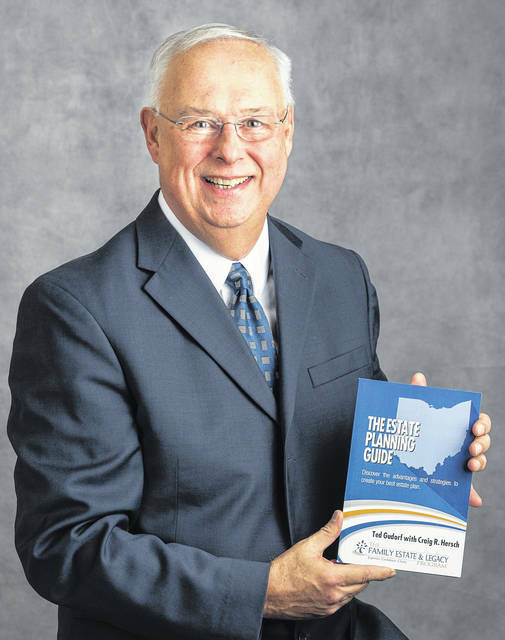 Board Certified Attorney Ted Gudorf of Clayton holds a copy of his recently published book, The Estate Planning Guide. CLAYTON — The American Bar Association recently reported that nearly 70 percent of adult Americans have not done basic estate planning, which includes planning for both a mental disability and death. One local attorney has decided to do something about this sobering statistic. He has published a book to help people discover the advantages and strategies to create the best estate plan. The book is called The Estate Planning Guide and is written by Board Certified Attorney Ted Gudorf of Clayton. Gudorf is a graduate of the University of Dayton School of Law and has a post doctorate degree in estate planning and elder law from the prestigious Western New England School of Law. Gudorf is the managing attorney of Gudorf Law Group, Dayton’s only AV rated boutique estate planning, tax advisory and elder care law firm. The Estate Planning Guide explains how planning is more than just a simple, one-time transaction. Not only does the book make the reader want to revisit outdated documents, it clarifies answers to many important questions that families face. The Estate Planning Guide also details Gudorf Law Group’s unique and specialized approach to the estate planning process. If you feel overwhelmed by the planning process and do not know where to start or who to trust, or if you’re curious about planning opportunities you may have never considered before, The Estate Planning Guide is a must read. The Estate Planning Guide is available to the public at Gudorf Law Group, LLC located at 8153 N. Main Street, Clayton, Ohio and online at amazon.com. For more information go to www.DaytonEstatePlanningLaw.com or call (937) 898-5583.